There seems to be a lot of misconceptions when it comes to headlights. Considering that headlights are one of the most important features of cars you'd think there wouldn't be so much disinformation about them. In this article I want to clear up these misconceptions and explain all the permutations and different variations of car headlights nowadays. Manufacturers tend contribute to the many terms and contradictions in the headlight world. I am going to separate this article into three separate sections. The headlight "housing" is basically where the bulb lives. I am using the term "housing" to describe where the bulb is mounted and situated to provide the optimum light output and beam pattern. Reflectors are by far the most common kind of headlight, although nowadays that may be changing. I am not going to bore you with the science of how this kind of headlight works, but basically, the headlight bulb is mounted within the housing and chrome paint "reflects" the light that the headlight outputs onto the road. The little chrome piece that is covering the actual bulb is in place to prevent the bulb from blinding oncoming drivers, and to control the beam pattern. This headlight style seemed to be dying out but it seems that they may be making a resurgence (One internet to whoever IDs those headlights). Projector headlights, a relative newcomer in the headlight world, as their name suggests they "project" light onto the road. The bulb here is mounted within a "projector bowl", which similar to the reflector housing, reflects all of the light towards the magnified projector lens (there are different kinds of lenses and projectors, and this website is an awesome resource for learning and buying projector based equipment) in a metal housing which is chrome painted. The light then hits a piece of metal that is shaped like the pattern of light that will be projected onto the road. Why this is like this is some sort of marvel of science and magnets. The projector housing lives within the headlight and is usually a removable piece, and has lead some enterprising individuals to retrofit projectors from more modern cars (NOT entire headlights) into their reflector based headlights if there is not a facelift version with projector headlights. Generally projector headlights provide superior light output with a sharp cutoff line and focused light. The bulb is what provides and creates the light that gets reflected/projected onto the road. Generally for most of car history, these bulbs have been little glass tubes vacuum sealed and containing a filament and halogen gas. However in recent times, as with almost everything with cars, new challengers to the venerable halogen gas based headlight have appeared. Halogen bulbs are the most common kind of headlight bulb. There are many different kind of halogen headlights, all to fit different reflectors and projectors. These headlights provide the familiar yellowish light that older folks will remember when staring at a highway. These are generally pretty boring headlights. 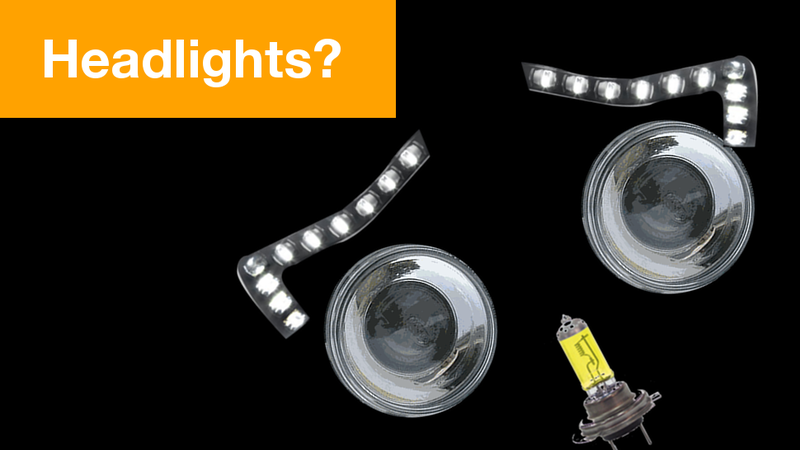 HID/Xenon headlight bulbs are a relative newcomer compared to the halogen bulb. While HID/Xenon is technically more than a bulb, including a ballast and igniter, to keep it simple we can ignore that bit for now. Xenon lights provide the white/bluish light you see out of the headlights of more modern cars/retrofit cars or the headlight of choice for ricers (P.S., if you installed an HID kit in your car and it looks like that please buy this laser and have your buddy aim it your forehead). This kind of headlight provides superior light output and better color (this may be a personal preference) than halogen style headlights. These are the newest kind of headlight "bulb" (they technically aren't a bulb), and only recently have they been implemented as headlight units. Mercedes, Audi, Lexus, Acura, and BMW have been experimenting with these kinds of headlights lately, and to be very honest I do not know very much about them since I haven't driven or been in a car equipped with such headlights. The upside to LEDs is that they draw very little power, are decently small, and can be used in all sorts of creative ways. LEDs have been previously used in taillights, along in blinkers and in interior lighting. 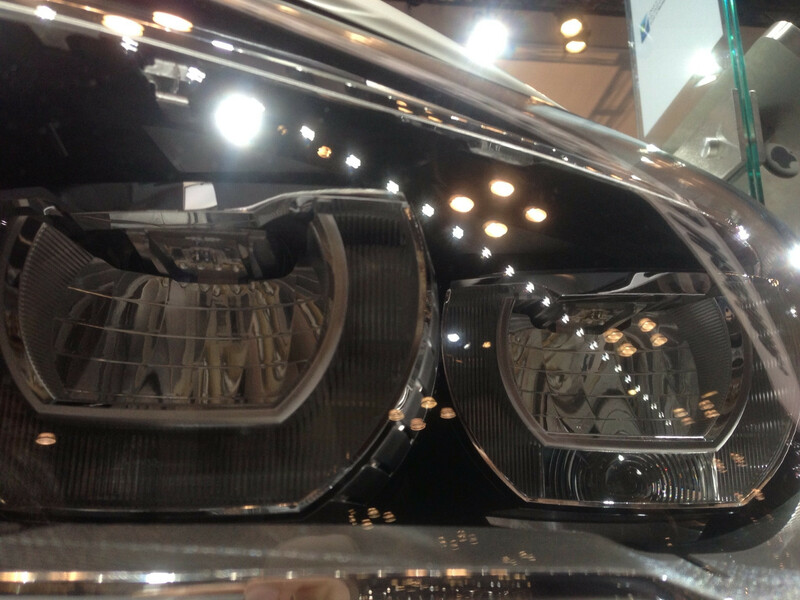 These are the cutting edge of headlight technology. The next headlight frontier. A good article about these headlights is here. Now that we have covered all the different types of technologies and versions of headlights, possibly the MOST important thing you can take away from this article is that ALL of these things listed are interchangeable with each other. An HID/Xenon is not always a projector. A halogen headlight can be a projector. LED headlights come in projector and reflector versions. Point is, these can all be combined, and to describe a headlight accurately you need two separate terms. "Projector Xenon/HID", "Reflector LED", "Halogen Projector". The term Bi-Xenon really peeves me off. Let's talk about what a Bi-Xenon is. Bi-Xenon is basically marketing jargon for a projector headlight that activates a solenoid when the High beams are activate. The solenoid in the projector moves downwards, allowing for more light in the projector bowl to actually escape through the magnified glass. This basically provides a "high" beam even though it is still the same beam. Now here is where it gets stupid, an american Fiat 500 which is a car with Halogen projectors, has this same setup, albeit with halogens. Fiat describes this setup on their website has "Bi-Function Halogen headlights". Bi means two and Bi-xenon/halogen (insert your joke of choice here) would imply two , and unless the car has two projectors, this description doesn't make sense. Oh, and also, a Bi-Xenon can be a reflector based headlight with an HID. Second gen Priuses with HID/Xenons have this setup. The first american car with HID/Xenons was a Lincoln Mark VIII with a proprietary Sylvania DC(!) setup. A lot of cars have Halogen high beams to supplement the Xenon/HID or to act as the sole high beam. Xenon/HIDs are not very suitable as separate high beams since they have a longer warm up time and flashing them drastically reduces their lifespan. A lot of cars also have a halogen beam to complement the HID/Xenon with a solenoid (aka bi-xenon). The WORST thing you can do, is install an HID/Xenon kit in a reflector (OR projector) that was made for a halogen headlight. Usually these headlights are designed specifically for the light output of a halogen and since HID/Xenons give out more light than a halogen it screws up the light output and light leaks all over the place and you generally end up blinding every oncoming driver. A DRL is NOT a headlight. That's it. Thank you for reading, please comment if I have messed anything up/typo'ed something. If you have a retrofit headlight car I'd love to see it along with the story that led up to it. I apologize if something here doesn't make sense because it is in my mental language, and that my 4AM sleep deprived mind made something sound stupid. Thank you.